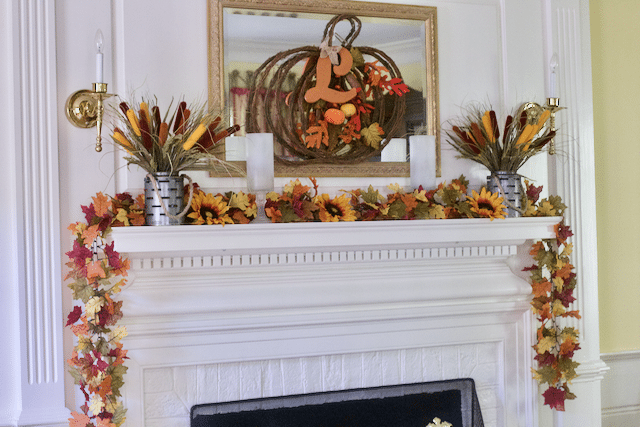 The weather has turned and its time to start changing up your fall decor with these decorating mantel ideas. 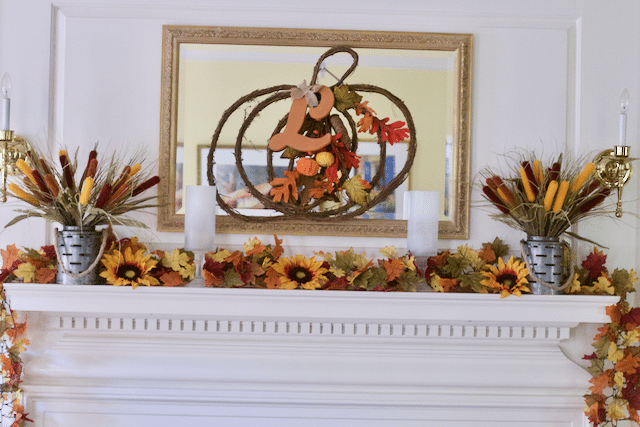 This post about Decorating Mantel Ideas For Fall Decor is sponsored by BSMedia and At Home. All opinions are my own. #AtHomeFinds #sponsored. 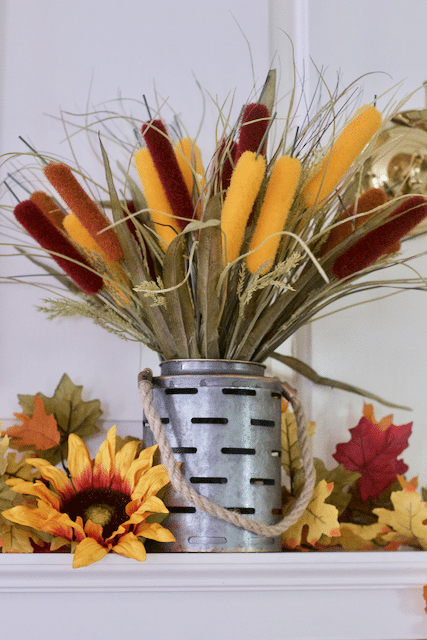 With the possibility of an Indian summer it is always hard to get into the fall decor mind sent. If you head to any big store, all you see is Christmas decor. I must say I am not ready for this yet as we love Halloween and Thanksgiving at our house. Shopping for the first time in At Home Stores had me really excited to mix things up and create a new look for my living room mantel without breaking the bank. The living room mantel is pretty boring when there is not a holiday and have no designated mantel decor. So excited to discover how At Home provides a full solution for their home, with a massive selection of specialty products for seasonal entertaining. We hope you like our fireplace mantel decor transformation as much as we do. Nothing too exciting right? Well that is about to change with the great fall decor accessories we purchased At Home. 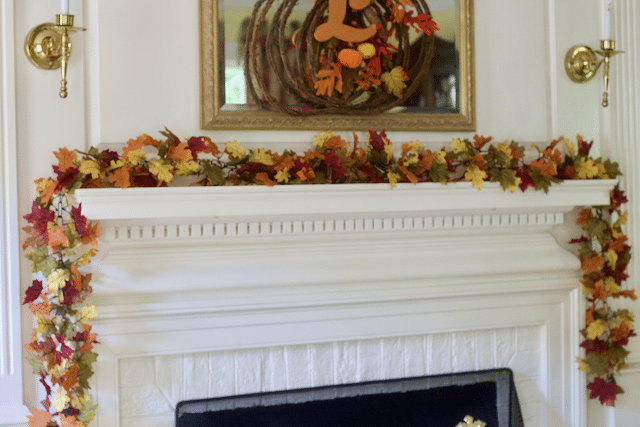 For our Mantel wall decor, or to cover the plain mirror, we found this grapevine pumpkin that was already decorated but we decided to add a personal touch with the orange letter L.
Use a suction cup wreath holder or any other hook you feel comfortable using. We found some cute fall garland as well. Simple and it came in two different fall color themes, we went with the brighter of the two offerings. 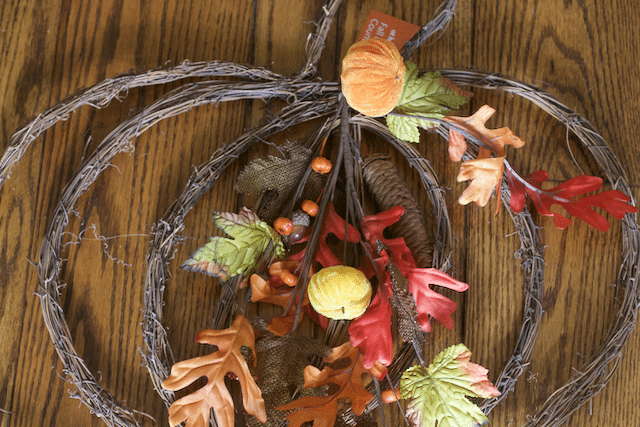 If you want some overhang on the mantel, buy two strands of the fall garland like we did. 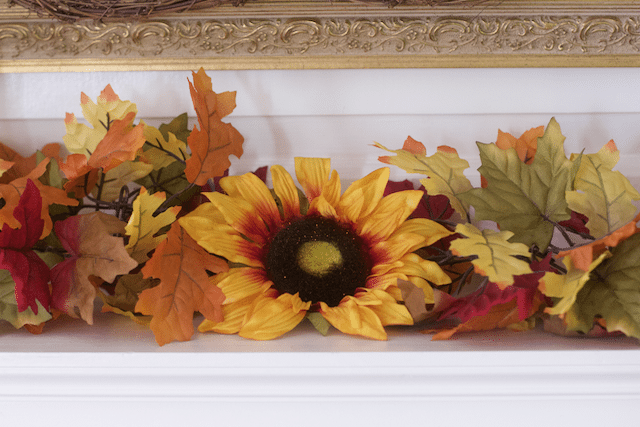 Fill the spaces where you connect your fall garland on the mantel with some sunflower heads we took off a bunch we found At Home. 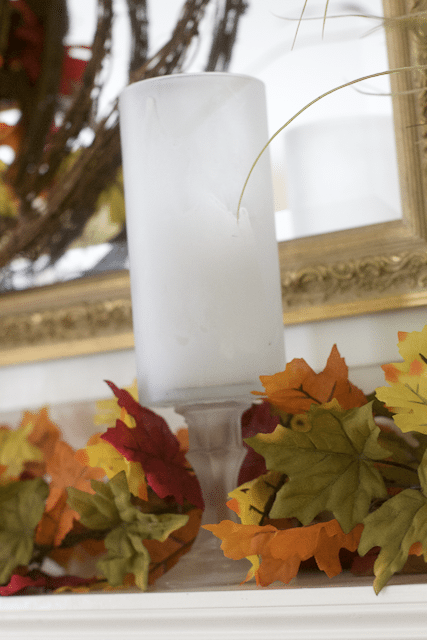 To round off the top of the mantel decor we added our DIY frosted candle holders. 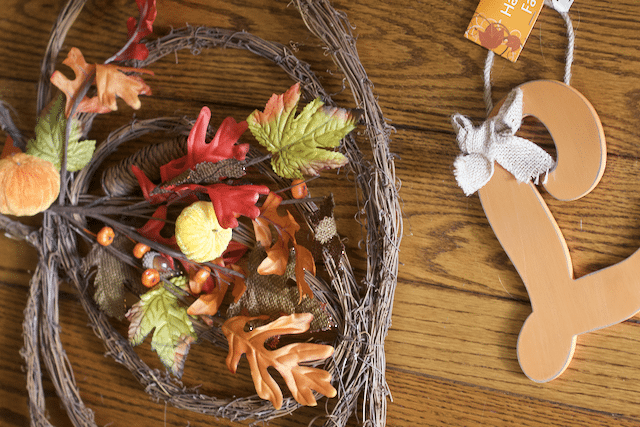 This will add a little more light to our fall mantel decor. For each end of our mantel we filled these tin candle holders with more silk floral offerings. This is two sets of the cat tails for each tin container. We can reuse the candle tins for summer parties too. 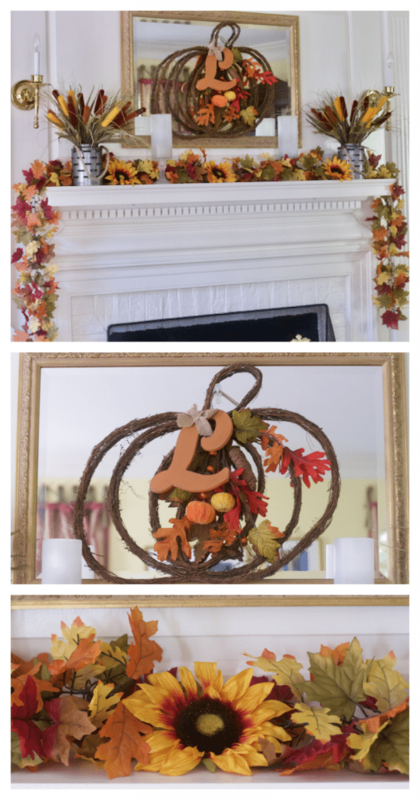 In just a few steps and under $100 we created these amazing Decorating Mantel Ideas For Fall Decor. What do you think? The room is not long enough to get a good picture of the entire mantel decor ideas so we took a few different angle shots. The room is ready for fall entertaining and since it is a formal space I will keep it through Thanksgiving. Check out our Halloween Mantel Decor that we use in our TV room. 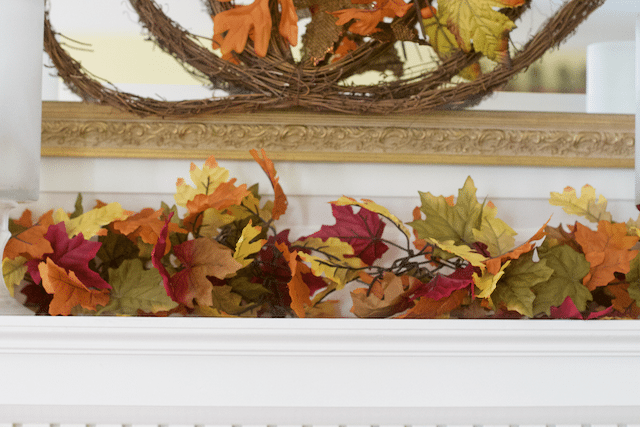 PIN THIS for some Fall Decor Inspiration when you start planning your Decorating Mantel Ideas. Wow ! This is a great way to vamp up the fire place. I don’t do much at all, ok I don’t do anything for mine but this is a great way to make it look festive for the fall! I love all fall decorations! Your mantle is adorable! I just did a spooky mantle which I’ll convert into fall for Thanksgiving. I love changing up my mantle decor. My favorite time of year… fall. I get to wear my sweaters and decorate my house. Your mantel looks absolutely perfect for Autumn! 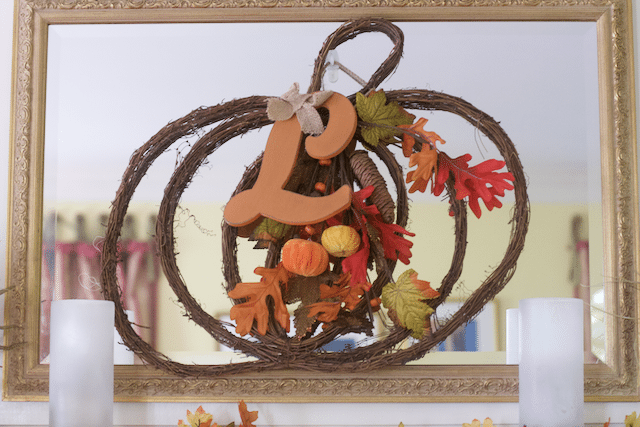 I love how you added the personal touch with the “L” on your pumpkin decor. Very cute! I think I could give up fall for Hawaii….. I had sunflowers at my wedding, love them. I am loving this entire fun fall look! The classic colors you used are perfect and sunflowers always brighten my day. Gorgeous! I have these velvet-like filled pumpkins that I bust out every year during Fall. But we’re in the midst of moving house, and packing – so unfortunately they can’t come out to play yet. I love decorating my house for fall. It makes my house feel so cozy and warm. I’ve been meaning to buy some garland to decorate with this weekend. So beautiful! This is classy and elegant. We live in Hawaii, so I like seeing fall decorating ideas as inspiration for my house. Although nothing outside changes, I can feel a little bit of fall inside my house!